So many people have questions about USDA licensed breeders, the people who inspect them, and why certain licensed breeders are allowed to get away with many violations without any consequence- not to mention the many problems we have with small town zoos. The Animal Welfare Act can be difficult to interpret, and it is subjective to each inspector. Thanks to the Best Friends Network, I was able to come across this explanation and then expand on it. This explanation regarding USDA inspections and the federal Animal Welfare Act (the laws that the USDA licensed dog breeders must adhere to). “It’s important to note exactly what inspectors are looking for when they arrive at a USDA licensed kennel. Their job is to make sure breeders are adhering to the minimum standards set forth by the Animal Welfare Act (AWA). They can look at a facility with hundreds of dogs in small cages, desperate for human attention, and note no violations. Animals covered under this act are: Dogs, Cats, Monkeys (other nonhuman primate mammals), guinea pigs, hamsters, rabbits, and other warm-blooded animals that is intended for use in research, testing, or exhibition. Not all animals are covered by this act. Excluded animals include: Birds, Cold Blooded Animals, Fish, Rats and Mice, Amphibians, and livestock (cows, horses, pigs). 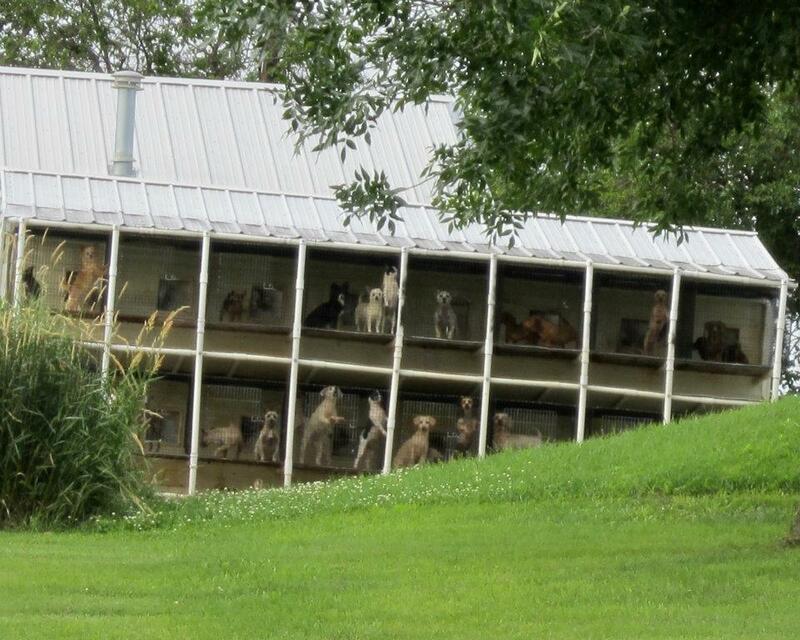 Facilities not covered by the AWA include pet stores, farms and hobby breeders. As noted above, the AWA does nothing to address boredom, emotional well- being or quality of life. A dog spinning in circles in a tiny cage 24-7 would not trigger a USDA violation as long as that dog appears outwardly healthy and the cage is at least 6 inches taller that the dogs’ head and 6 inches wider and longer than the dog measures from nosetip to tail BASE. This is an example of why the AWA needs to be rewritten. Emotional torture is every bit as damaging as physical torture for these dogs. The AWA requires that basic standards of care and treatment be provided for certain animals bred and sold for use as pets, used in biomedical research, transported commercially, or exhibited to the public. Individuals who operate facilities in these categories must provide their animals with adequate care and treatment in the areas of housing, handling, sanitation, nutrition, water, veterinary care, and protection from extreme weather and temperatures. Sadly, the word adequate doesn’t meet many of OUR standards. Most commercial breeders use wire flooring on their cages so the feces and urine are able to fall through the openings. This set up is another cruel part of the industry. When people started getting smart and complaining that the wire flooring was causing further injury and deformity to the dogs, the breeders asked that the USDA refer to it as “mesh”. After many people spoke up, the USDA required the wire to be coated, as opposed to making the wire thicker. Any attempts at making changes to these regulations has been met with much resistance. Although Federal requirements establish basic standards, regulated businesses are encouraged to exceed these standards. (AWA website.) Most do not. And AS ALWAYS… If you don’t think these laws are strict enough, please contact your legislators on the federal level! Let them know that these laws need to be updated big time. It’s sad isn’t it? And these breeders are politically savvy, teaming with the livestock industry. They also have powerful lobbyists. Thanks for all of your work Mindi. The Animal welfare Act is national. My assumption is that individual states can have higher standards, if they choose. Is this correct? If so, maybe a group needs to focus on Iowa legislators. If the group is successful, other states may follow suit. Again, thank you. the people that keep these wonderful creatures in circumstances that are devoid of any love, attention, or any stimuli whatsoever are probably hopeless. It becomes the job of people who care to take action. Can you post the link to the Iowa House and Senate? Have you discussed with others the best way to publicize this? This truly sickens me. 🙁 Thanks for sharing! I hope more people realize what goes into making those furry balls in store windows. Maybe I am extremist when it comes to this subject, but they really need to regulate breeding and if you ask me, I think there should be a limit to how many breeders are allowed PER breed in this country. I would make sterilizing pets THE LAW and not an option. There are way too many homeless animals to go around and even more euthanized daily. This is truly sickening… I wholeheartedly agree that we need to regulate breeding. I recently moved my animal with TLC Pet Transport and they did a very good job… They are people who really care about animals. That is soooo disgusting! I can’t believe these people would consider themselves as human beings! !